SSO-A, with satellite mass simulators attached for testing. Photo: Spaceflight. 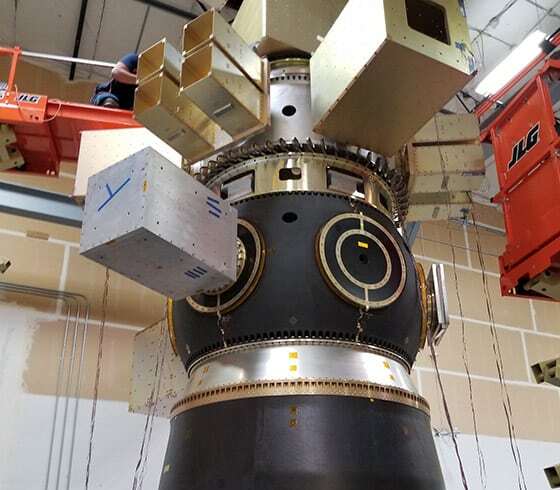 Rideshare launch and mission management provider Spaceflight will launch more than 70 small satellites from nearly 35 different organizations on a dedicated SpaceX Falcon 9 rocket from Vandenberg Air Force Base later this year. If successful, the “SSO-A: SmallSat Express” mission would be the largest dedicated rideshare launch from a US-based launch vehicle in history. Spaceflight initially purchased the SpaceX Falcon 9 in the fall of 2015 to accommodate a number of domestic, international, government and commercial customers seeking access to Sun-Synchronous Low Earth Orbit. Some of the notable customers onboard include University of North Carolina-Wilmington, NovaWurks, Astrocast, Honeywell Aerospace, HawkEye 360, Nevada Museum of Art, Fleet Space Technologies, Audacy, University of Colorado Boulder Laboratory for Atmospheric and Space Physics, and many others. Planet is sending two SkySat smallsats, the primary spacecraft on the launch, along with several Dove cubesats. In an interview with Via Satellite, Spaceflight President Curt Blake outlined the three-year process of assembling and organizing the SSO-A mission. “Before purchasing the rocket, we had a number of customers who expressed interest in this particular launch. Since the purchase, we’ve been manifesting the mission in full, coordinating logistics and developing the stack needed to deploy the payloads successfully. We’re really excited to see this mission come to fruition,” he said. The full interview with Curt Blake, which includes comments on future missions and available launch vehicles, will be published right here on Via Satellite on Tuesday, August 7. Stay tuned! Spaceflight has launched more than 140 satellites to date from a variety of launch vehicles including Falcon 9, PSLV, Dnepr, Antares, and Soyuz, and has announced agreements for launches on Electron, Vega, and LauncherOne. Spaceflight has already launched 22 spacecraft on two missions this year and has plans to launch 97 more across six upcoming missions to LEO and GEO by the end of 2018, with an additional 10 scheduled missions in 2019. The post Spaceflight, SpaceX Set for Largest Dedicated Rideshare on U.S. Rocket appeared first on Via Satellite.